Welcome to the beautiful Pacific Northwest, where tree fruit is our specialty! 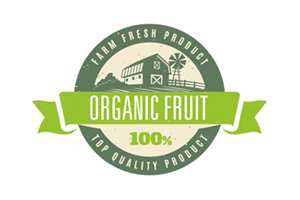 Get to know Sage Fruit Company as we take you through the process of growing, packing and shipping the world’s best apples, pears, cherries, peaches, apricots & nectarines. Have you tried a Smitten? Once bitten, you’ll be forever Smitten! The search for the next great eating apple began in New Zealand in 2005. By 2011, Smitten was introduced to the United States courtesy of Pegasus Premier Fruit. Today, only a few apple shippers across the country are responsible for the growing, packing and distributing of this unique variety within the domestic market – which includes Sage Fruit! 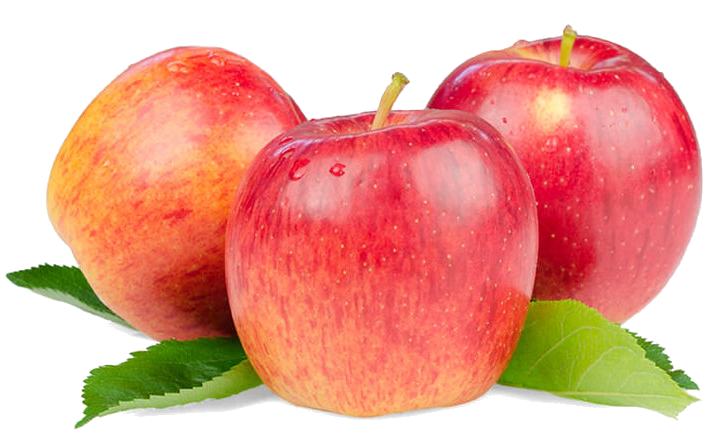 Smitten is a cross pollination of Gala, Braeburn, Fiesta and Falstaff. 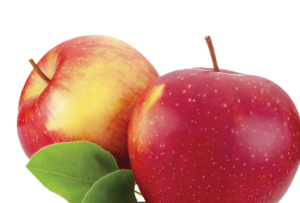 Smitten is a hardy apple that remains firm in refrigeration – it stores tremendously well! Smitten has a perfectly well-balanced flavor. It is sweet, with a hint of tartness and complex aromatics. Curious yet? Head to your local grocer and pick some up! Let us know what you think. Can’t find them? Ask your produce manager. We’re also giving you an opportunity to enter for a chance to win a sample case of Smitten apples + $100 Amazon Gift Card! Click here for more details. 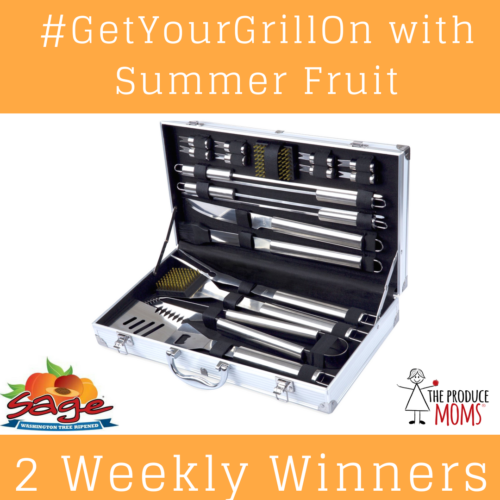 Summer is the perfect time for family cookouts, so #GetYourGrillOn with Summer Fruit! 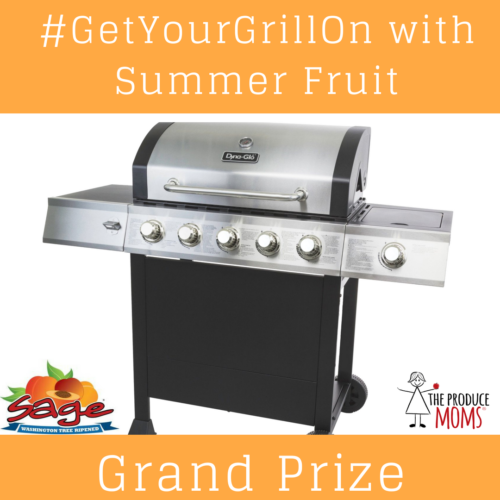 We’re hosting our first ever Instagram contest with The Produce Moms and we’re giving you a chance to win a new grill! Grilling peaches for dessert? We want to see it! How about fruit kabobs? Snap those pics! Head on over to our Instagram now and enter for a chance to WIN…1 Grand Prize Winner + 2 Weekly Winners! 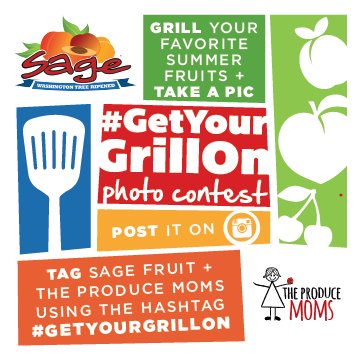 Take a photo of your summer fruit on the grill, tag @sage_fruit & the @theproducemoms and use the #GetYourGrillOn hashtag. Like this post and tag a friend. Each new comment + friend tagged counts as an additional entry. Open to US only…winner will be announced on Instagram on Monday, August 27th. Make sure your Instagram is set to PUBLIC, so we can view your post. This past spring, we welcomed a new growing and packing facility to the Sage Fruit Family. With this new warehouse (Vanguard Pride Packing), we added more apples and cherries to our inventory….but, we also added A LOT of Northwest grown stone fruit. So, as much as we enjoyed the summer before, we now have three more reasons to love it – apricots, peaches & nectarines! While our apricot season is already over, we are just getting started with peaches and nectarines. 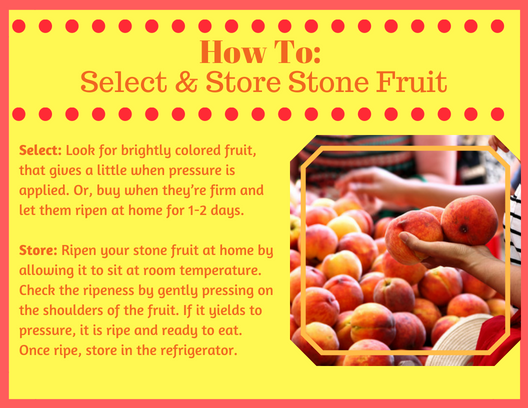 What is a stone fruit? Beginning this summer, we have both Conventional and Organic peaches and nectarines available. ALL of our peaches and nectarines are tree-ripened for the sweetest flavor! You might be asking yourself, “What does tree-ripened even mean?” Well, we allow the fruit to remain on the tree as long as possible in order for it to have the opportunity to reach its highest sugar content. We pride ourselves on delivery an exceptional eating experience, and know that the tree-ripening process in the most important aspect of our stone fruit growing. While we pick the fruit when it is still firm, we do not pick it when it’s green. So, you can eat it as soon as you get it home, or let it sit on the counter to soften up a bit. Peaches have a delicate aroma, and a skin that is velvety. Depending on the pit, peaches are classified as either freestone or semi-cling varieties. A freestone peach can have its center stone easily removed from the flesh because it is not attached. In contrast, the center stone of a semi-cling peach is attached to the flesh. 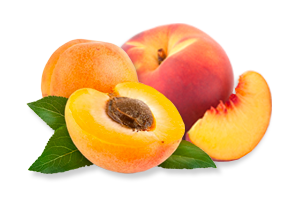 Freestone peaches are much more suitable for canning than semi-cling peaches, however there is no noticeable difference in flavor, and both are excellent for eating fresh! Additionally, the flesh of peaches can be different – we grow both white flesh and yellow flesh varieties. Yellow Flesh: Sweet and well-balanced flavor. Nectarines and peaches are closely related. However, they do have one visible difference, which is their skin. Peaches are velvety, whereas nectarines are smooth. Their skin is brightly colored gold with hues of ruby and pink throughout. All nectarine varieties are semi-cling. Like peaches, nectarines can either be yellow flesh or white flesh. The flavor profile of each, also follows similarly to peaches. Need help picking out the perfect fruit? Use the guide below! It’s officially summer here in the Pacific Northwest…. Cherry season has begun! From now through August, we will be picking, packing and shipping these little gems seven days a week. In all likelihood, when visiting your local supermarket, you will find two different types of cherries. Although there are numerous varieties for each type, we classify them as Dark Sweet and Rainier. But, what’s so different between the two? The obvious difference between them is their appearance. 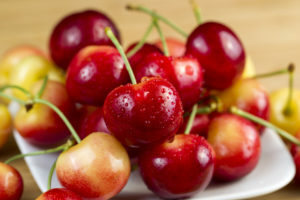 Dark Sweet cherries are a rich, mahogany color, whereas Rainier cherries are yellow, with a tinge of red. However, their flavor profile also sets them apart from one another. Rainiers have a lower acidity level, which results in them having higher brix (sugar content). Thus, Rainier cherries are actually sweeter than Dark Sweet cherries. In addition, the growing season for Rainier cherries is much shorter. There is less acreage planted in the Pacific Northwest, therefore there is less volume to supply consumers with. You can find Washington grown Rainiers at retail from mid-June until mid-July. Dark Sweets, though, you will be able to find until the end of August. 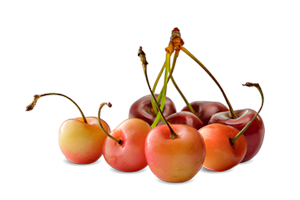 Quick Fact: Developed in 1952 at Washington State University, the Rainier cherry is a cross between the Bing and the Van. It gets its name after the highest peak in the state of Washington. 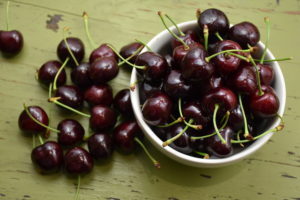 Dark Sweet – Look for cherries that are a deep red, mahogany color with green stems. Rainier – Look for yellow with red blush on the shoulders of the fruit and green stems. Always store your cherries in the refrigerator until you are ready to eat. Keeping them in the refrigerator prevents them from becoming soft and helps prolong their shelf-life. Before eating, be sure to wash your cherries by rinsing them under cool running water. Unlike some other fruits and vegetables, no additional wax is added to cherries, but it’s always a good idea to rinse your fresh produce! As I’m sure you are well aware, new products are frequently being introduced to the marketplace – including in your produce department! Just like any other industry, we look for opportunities to excite and engage consumers. For us, that means actively seeking the most flavorful, consumer-friendly apple varieties to plant in our orchards and ship to your supermarkets. So, without further ado, we would like to introduce you to the newest member of our apple family…. Breeze! The Breeze has a solid pink-red blush over a yellow background. It is aromatic and sweet with a crisp, dense white flesh. Breeze are originally from New Zealand and have been made available to us through our partnership with Freshco. They are harvested for a two-week period at the end of February, and then shipped to the United States for a mid-April arrival. Due to the increasing demand for the Breeze apple, growers in New Zealand have already doubled their production. And now, we at Sage Fruit, have acreage in Washington as well. Soon, Breeze apples will be available year-round! Why? First, New Zealand grows apples very similar to the way we do here in Washington State. Their growing regions mimic ours; they have warm summer days, cool summer nights and crisp winters. Because of this, they are able to produce the same quality of product that we do. Second, when it’s Spring here, it’s Fall there, which means their harvest occurs as our volume is decreasing. We don’t import ALL varieties, but there are a few, that for one reason or another, the state of Washington cannot provide for a full 365 days. 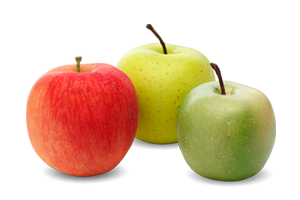 In order to keep consumers supplied with their favorite apple varieties all year, we use the different growing seasons to our advantage. Plus, they have new and delicious varieties (like Breeze!) they want to share too. Have you tried a Breeze? No? Well, we’re giving you a chance to “Taste the Breeze!” You can enter for your opportunity to win a sample box + $100 Amazon gift card right here. Be sure to look for them in your produce department, and, if you don’t see them, ask your Produce Manager! Spring has sprung! Sort of. We know many parts of the U.S. are still experiencing winter weather, but here in the Pacific Northwest, we are gearing up for one of our favorite times of the year…. bloom! The birds are chirping. The bees are buzzing. 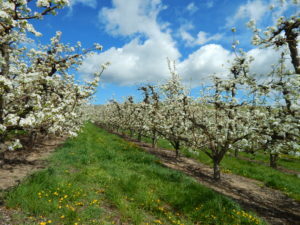 Soon, fruit trees around the state of Washington will be covered in pink and white blossoms. In no time at all, Washington cherries, apricots, peaches and nectarines will be available at your local grocery store! Then, not too far behind them, you’ll start seeing new crop apples and pears. So, how long does it take from bloom to harvest? Harvest timing is not the same for all tree fruit; it varies based on 1) the type of fruit and 2) the variety of fruit. For cherries, it can be anywhere from 55 days to 90 days depending on the variety. Bloom varies from year to year; weather has a large hand in when it will occur. The earliest full bloom date recorded was April 9th, in both 2015 & 2016. In 2017, the full bloom date was May 1st (for apples). Full bloom is defined as the day 60% of “king blossoms” are open on the north side of the tree (WSU Tree Fruit). Daily high temperatures are used to predict bloom based on degree days (DD) above 43℉. Red Delicious happens to be a relatively late blossoming apple cultivar. Other apple cultivars, on warmer sites in the local region, will bloom up to a week earlier. Elevation and slope aspect are quite variable over short distances in Eastern Washington (state), and very influential in relation to blossom development rate. Lower elevation orchards (~700 ft. elevation) may see blossoms up to a month before higher elevations (~3,400 ft.) (WSU Tree Fruit). Apricots are the first tree fruit to bloom in Washington, which is typically 3 weeks prior to Red Delicious. Peaches and nectarines are next, and are about 14 – 17 before apples. Cherries follow peaches and nectarines, blooming roughly 10 – 14 days before apples. Then come pears, which are about 7 – 10 days prior to apples. During bloom, pollination must occur in order for fruit to develop. 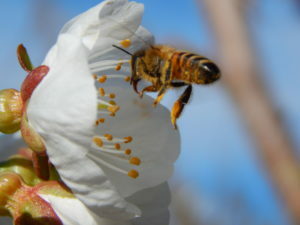 Pollen is transferred primarily by honeybees. Honeybees work best when temperatures reach 65oF+. At Sage Fruit, our harvest begins with cherries in early-to-mid June and finishes in early November with the last of our apple varieties. Each orchard block is evaluated individually using various fruit maturity-testing methods. A general benchmark growers tend to use to estimate maturity date is “days after full bloom.” This is especially helpful if the grower has data from previous years. Depending on weather, the value may vary from 5-20 days year-to-year. Maturity testing typically begins 2+ weeks in advance of the estimated harvest date, and continues each week until the fruit is picked from the tree. Firmness, soluble solids concentration (SSC) and starch content are the primary tests performed to determine how far a long the fruit is. Other considerations include: fruit size, taste and skin coloration. For more on specific maturity testing click here. The Washington State University database is extremely helpful! The Produce Challenge for today is a D’Anjou pear. Luckily, this is something we know a little bit about, so it wasn’t too difficult to find a recipe! Divide your diced fruit at the bottom of three mason jars. 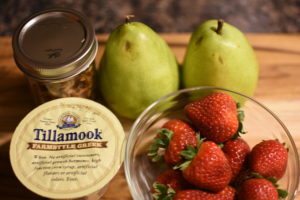 Top fruit with one container of Greek yogurt per mason jar. 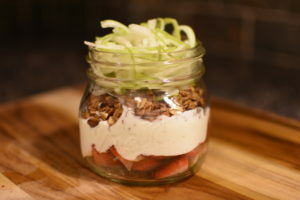 greek yogurt with 1/3 cup of granola per mason jar. 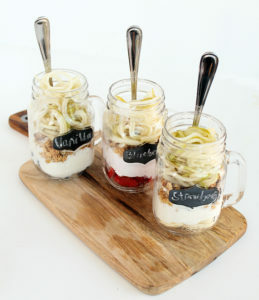 Top granola with pear noodles in each mason jar. Prep Time: 5 minutes…..or less! For this, we took the fresh and easy approach – no cooking required! The best part about a parfait is that you can really use whatever fruit you want. I happened to use strawberries, but if you didn’t want to do any cutting, go with blueberries or raspberries – there is NO bad combination for a breakfast parfait. As far as the granola goes, I used what I had leftover from earlier in the week and yes, it was still amazing! 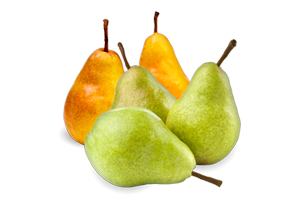 When purchasing your D’Anjou pears, be sure to Check the Neck – apply just a little pressure with your thumb at the top of the neck of the pear; if it gives a little, it is ripe and ready to eat! I’ve eaten rutabagas, turnips and beets, but I can’t recall a time that I’ve ever eaten parsnips. So,for today’s Produce Challenge my goal was to find an easy-to-follow recipe that would leave little room for error during preparation. I settled on a roasted fruit and veggie mash! Preheat oven to 350°F. 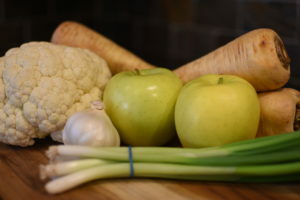 Toss cauliflower, parsnips, and apples with two tablespoons of oil. Spread out in a single layer on a baking sheet. Roast for 35-45 minutes, until lightly charred & parsnips are able to be pierced easily. Immediately transfer to a high powered blender. Add garlic, almond milk, butter, salt, and black pepper. Pulse until smooth. For a thinner mash, add the additional 1/4 cup almond milk. Although an hour seemed a little excessive to me for a side dish, it was nice to have time to prepare other aspects of the meal. It was easy to pop the baking sheet into the oven, set the timer and then go about doing other things. For this recipe, I chose to use Golden Delicious apples. Their own flavor is very mild, and they tend to take on the flavor of what it is they are being cooked with; I didn’t want the taste of apples to be too overbearing. What I found to be most interesting about parsnips is that they are much sweeter than I expected. I was anticipating more of a potato flavor, but was pleasantly surprised. 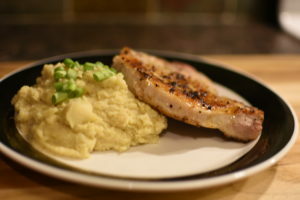 For my main course, I paired the mash with a pan-fried pork chop; it was a sweet and savory combination. The next time I make it though, I will likely add a sprinkle of cinnamon and a sprinkle of nutmeg for a little something extra. Up until recently, I’d only really eaten sweet potatoes during the holidays; they’ve always been a staple at Grandma’s dinner. However, I have started using them more frequently, so I was really excited when I saw they were on the calendar for February. 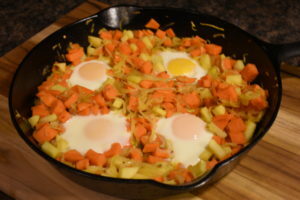 In a large cast iron skillet over medium heat, sauté the sweet potato and onion with the oil and water for 5 minutes, until the onion starts to turn translucent. 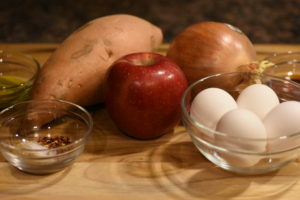 Add all of the other ingredients, except for the eggs, and cook for another 5 minutes or so. Just until the apples start to soften up. Stir occasionally to prevent anything from sticking to the pan. Using a spoon or spatula, make 4 small holes in the mixture and gently crack an egg into each hole. Transfer the pan to the oven and bake for 8-10 minutes, until eggs are cooked. Prep Time: There wasn’t one listed, but I’d say give it about 20-25 minutes. 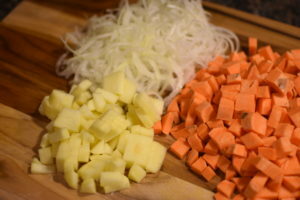 I used a combination of sliced and diced for my apples/potatoes/onions. 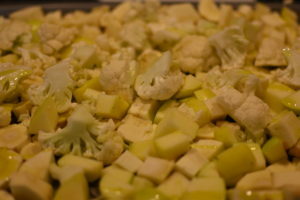 Although the recipe called for wedges of apples, I wanted them mixed in more, so I cut them smaller. 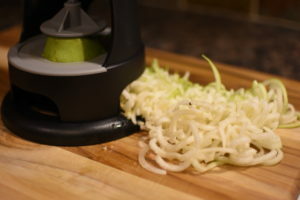 Also, if you don’t have one, get yourself a spiralizer! 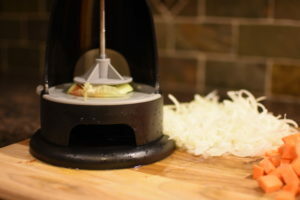 Mine is very basic, but I got it from Pampered Chef and it works GREAT for slicing onions. There were no tears shed and my onions were sliced perfectly thin. You can use it for all sorts of fruits and veggies. As far as the apples go, I settled on Fuji today. They are very sweet and they pick up the flavors of the spices well. In addition, they’re a juicier apple, so I cut the water out of the recipe; there was no need for added liquid. I imagine you could serve this as a side dish for dinner, but I ended up serving mine as the main course for breakfast and added some sausage patties on the side. The next I make this however, I will likely add the sausage directly into the skillet; cook the sausage first, then add the veggies in and follow the remainder of the instructions.